Inside Llewyn Davis (2013): Written and directed by Joel and Ethan Coen. 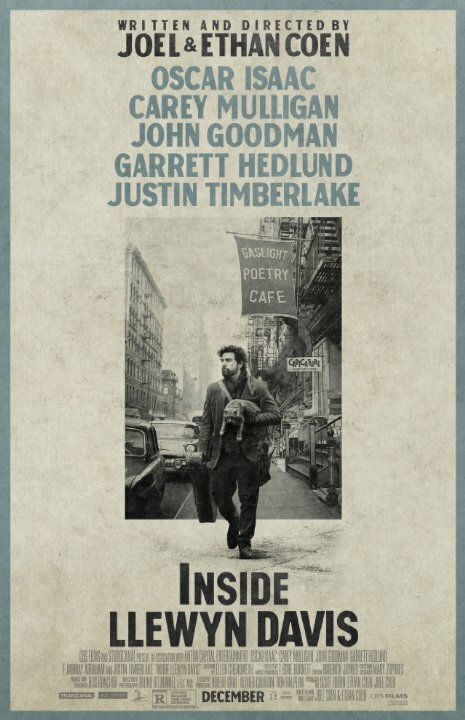 Starring: Oscar Issac, Carey Mulligan, John Goodman, Justin Timberlake, and Garrett Hedlund. Rated R for language including some sexual references. Running time: 105 minutes. After a three year absence (far too long in my book), the Coens have returned with a surreal odyssey of the mind recalling 1991’s Barton Fink or more recently 2009’s A Serious Man. I prefer these stories more than the broader comedies, mostly because I enjoy a side of philosophical meanderings with my main course of funny. This time the Coens have added the 1961 New York folk scene to their psychological sagas. This world is not reality, but a heightened Coen Brothers fantasy. What they have given us is an artistic journey that delves into the conflict between art and identity, between existence and transcendence, all without any preaching or hand-holding. What drives the plot, you may ask? Well, very little in fact. Struggling folk singer Llewyn just seems to find himself in a constant series of misadventures. The film floats and lilts, seemingly at its own pace, as if we’re watching Llewyn’s consciousness play out before our eyes. Considering it clocks in at under two hours, it never feels rushed, thanks to the meticulous detail in each scene. The Coen Brothers have blessed us with quite a gallery of characters—you want to see more of them, whether they be F. Murray Abraham’s studio exec Bud Grossman or Garrett Hedlund’s valet Johnny Five. It’s a credit to the way these characters are acted and written—watch how Carey Mulligan’s Jean incessantly curses out Llewyn for their affair, but can’t hide the fact that she still has feelings for him. The role of Llewyn Davis demands a deft balance of likability and aloofness, of clumsiness and grace. And man, have the Coens found it in Oscar Isaac. He and Chiwetel Ejiofor from 12 Years a Slave have broken out in 2013 after years of indelible supporting work. Like his forerunners (the great John Turturro in Barton Fink or the great Frances McDormand in Fargo), Isaac proves to possess the nuance of speech and physiognomy that define the Coens’ iconic characters. Those familiar with the Coens will find much to reward them—the writing remains as fresh, pointed, and irreverent as ever. Here the F-word achieves a kind of comic poignancy, especially when Llewyn has been warned by his sister not to use the word around her impressionable son. But more than that, the Coens seem to understand the plight of artists everywhere—Llewyn is beset by bad luck to be sure, but he’s also a victim of his own irresponsibility and impudence. Success seems to elude him at every turn, even as he shines in his performance scenes. The Coens stage them like conversations, cutting between Isaac and whoever his audience happens to be at the time. At one point Llewyn actually cuts out his guitar and just leaves his voice—an incredibly risky and vulnerable moment. Even if the “the artist’s life” eludes him, he can find it for a brief moment in the very act of performance. This film may prove challenging for some, but it only appreciates the more and more I kick it around my mind. The plot and situations might be messy, but the artistry never is. The duo’s next film can’t come soon enough for me.